Adopted name of Nakhmen Rozenberg, he was born in Lemberg into a poor household. He attended religious primary school as well as a Polish public school. In 1930s he was living in Warsaw, and later in Kuzmir (Kazimierz). During the Soviet occupation, 1939-1941, he was in Lemberg. He survived the Nazi rule in Poland on the Aryan side. In 1941 he alone witnessed the Ukrainian Nazis as they murdered the famous playwright and author Alter Kacyzne (described by Blits in a detailed report in Nayes lebn [New life], Lodz, 1946). In 1948 he moved with his family to Brazil and a short time later returned to Poland where he remained. 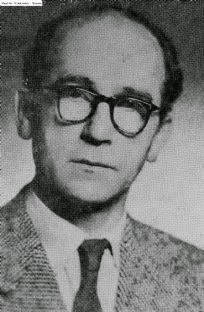 He published in Sovetishe literatur (Soviet literature) in Kiev (January 1940) a story entitled “Hersheles ershter aroystrit” (Hershele’s first performance). In book form, he published some short stories under the title: Fraynt fun nekhtn (Friends from yesterday) (Warsaw, 1938), 198 pp. ; and his work appeared as well in Lebn un kamf, zamlbukh fun der yidisher linker literatur in poyln (Life and struggle, anthology of leftist Yiddish literature in Poland) (Minsk, 1936). Sources: B. Ts. Tsangen, in Literarishe bleter (January 22, 1929); B. Shnaper, in Foroys (Warsaw) (March 4, 1938); Naye prese (Paris) (February 20, 1948).